Excellent critique of the CIA torture program from a scientific point of view. The US Government has just released its report on the CIA’s Detention and Interrogation Program, aptly branded the “torture report”, which is available online as a pdf. It makes for appalling reading but sheds light on the role of two psychologists in the creation and running of what turned out to be genuinely counter-productive ‘enhanced interrogations’ that were used in preference to already productive non-abusive interrogations. In the report the psychologists are given the codenames Grayson SWIGERT and Hammond DUNBAR but these refer to James Mitchell and Bruce Jessen who have been widely identified byothersources in the preceding years. Mitchell and Jessen were both contractors, who, according to the new report, arrived at detention centres to direct CIA interrogations, despite having no interrogation experience, and in face of sometimes severe reservations of regular CIA staff. Categories: Aggression, Research | Tags: CIA, learned helplessness, Torture | Permalink. “The brain registers all pleasures in the same way, whether they originate with a psychoactive drug, a monetary reward, a sexual encounter, or a satisfying meal. In the brain, pleasure has a distinct signature: the release of the neurotransmitter dopamine in the nucleus accumbens, a cluster of nerve cells lying underneath the cerebral cortex (see illustration). Dopamine release in the nucleus accumbens is so consistently tied with pleasure that neuroscientists refer to the region as the brain’s pleasure center. Categories: Research, Television, Video Games | Tags: addiction, ADHD, dopamine, Mouse TV, risk taking, video games | Permalink. 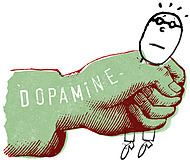 Neuro Research Project has a very interesting post on risk-taking, dopamine, and Dr. Christakis’s mouse study. Dopamine addiction is an overlooked problem.. Dopamine is the most addictive substance on the planet, a neurotransmitter produced in our own body. This TEDx video (Media and Children), by Dimitri Christakis, a pediatrician, parent, and researcher, shows young mice taking risks after being exposed to TV, 6 hours a day, for 42 days. The mice continued to take more (potentially life threatening) risks the longer they were exposed to TV. Categories: Research, Television | Tags: addiction, Dimitri Christakis, dopamine, Dr. Christakis, novelty seeking, risk taking, Television | Permalink. Until now, animal studies have never been done on the effects of television. I guess for the obvious reason that animals just aren’t interested in watching TV. This has been a huge disadvantage as animal studies have been essential for establishing that a whole host of things, from abuse, to cigarettes, to lead poisoning, to malnutrition are all bad for the developing brain. But then, Dr. Dimitri Christakis made a brilliant leap, and thought why not look at the effects of background TV on young mice. Since 2008 a handful of studies have shown that even background TV has at least short-term negative effect on young children. But what about the long term effects of background TV? It would be unethical to do experiments on young human children looking the effects of large amounts of background TV throughout their early years. And yet, in real life there is a substantial subset of young children who are being exposed to 4 to 8 hours of background TV every day. Correlational studies and longitudinal studies have found that children exposed to large amounts of television do worse academically, emotionally and academically. But critics have dismissed these studies as not taking into proper consideration other potential causes (such as poor parenting and/or genetics), with large TV exposure being a symptom rather than a cause. A mouse study has the potential to discover exactly what the effects are background TV really are and prove that these effects are caused by background TV and not by something else. So what did Dr. Christakis and his mouse study actually find out? Categories: Research, Television | Tags: ADHD, background TV, Christakis, Dimitri Christakis, hyperactive, learning problems, Mice, Research, Television | Permalink. As Linda Wasmer Andrews points out in her excellent article “How Background TV Undermines Well-Being”, there are two main ways that background TV is bad for you, it makes it harder to communicate, and it makes it harder to concentrate. Categories: Kids, Research, Television | Tags: 30 million more words, background television, background TV, chronic noise, language acquisition, noise level, young children | Permalink.